Plantar fasciitis is one of the most common orthopedic complaints people can have. The plantar fascia is a thick tissue along the bottom of your foot that connects the calcaneus (or heel bone) to the toes, helping to create the arch of the foot. Plantar fasciitis occurs when the plantar fascia becomes overstretched and overused, causing inflammation and pain. Many times, people that are prone to plantar fasciitis often have flat feet or high arches, may be overweight, participate in activities where they are on their feet for prolonged periods of time (i.e. long distance runners), have tight Achilles tendons (the tendon that attaches the calf muscle to the heel), wear non-supportive footwear, and/or have had a recent change in activities. So, what if these tips don’t help? Then it may be time to try physical therapy. Physical therapy for plantar fasciitis should not be a one-size-fits-all approach. The right physical therapist can provide you with a customized plan to address your specific symptoms with the hopes of returning you safely back to pain-free activities. A physical therapist can also help you navigate through multiple stretches and exercises; apply modalities such as thermotherapy and ultrasound; and analyze your walking. 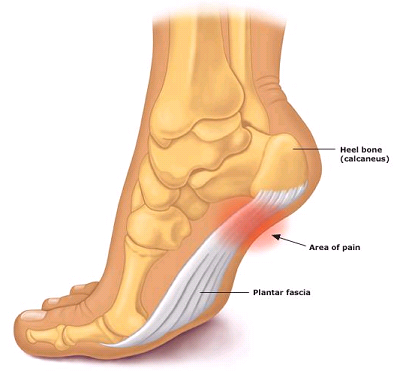 Another important part of physical therapy for plantar fasciitis is the manual techniques that your therapist can use to improve blood flow and decrease inflammation to the plantar fascia. One type of manual technique is called The Graston Technique, which is the use of stainless-steel instruments for soft tissue mobilization that enables the clinician to effectively address scar tissue and fascial restrictions in the area of pain to improve recovery time.